Paris Catacombs ca. 1861. Image from Wikipedia. Félix Nadar (1820–1910), born Gaspard-Félix Tournachon, was a French photographer best known for his portraits and aerial photography. Nadar also experimented with artificial light in his photography in the Paris Catacombs between 1861 and 1862. Because of Nadar’s early photographic experiments, we have the only images of workers assembling the bones in the Paris Catacombs. The Paris Catacombs, one of the most famous ossuaries in the world, is made up of a series of underground quarry tunnels that run for about 170 miles. This city of the dead contains the disarticulated bones from an estimated six million bodies that were exhumed from Parisian cemeteries in the 18th and 19th centuries. The Celtic people established the city of Paris in the 3rd century BC and by the 12th century it was the largest city in Western Europe. Over the centuries the capital of France experienced overcrowding, plagues, and war-all of which took a toll on Paris’ burial grounds. By the 18th century the city’s graveyards were bursting at the seams. The problem got so bad that in 1763 King Louis XV issued an edict forbidding burials inside the city. In 1786 a commission decided to exhume the graves from the city’s cemeteries and store the bones in the abandoned quarries beneath Paris, starting with the Cemetery of the Innocents. 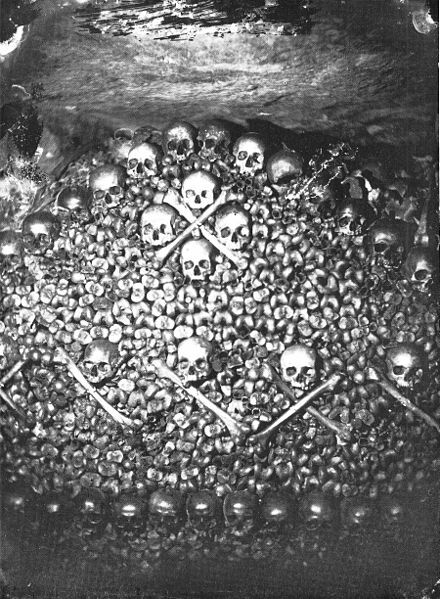 The bones were piled in heaps in the necropolis until 1810, when Napoleon authorized the General Inspector of the Quarries, Héricart de Thury, to renovate the Catacombs and organize the bones. De Thury instructed workers to build artistic facades with skulls and long bones to hide piles of other bones. The catacombs were completed in the early 1860’s. When Nadar went down into the catacombs in 1861 for his artificial light experiments he captured the workers putting the finishing touches on the famous necropolis. Below are some of those eerie photographs. Photo by Felix Nadar of a worker in the Paris Catacombs, ca. 1861. Image from Wikipedia. Worker piling bones in the Paris Catacombs, photo ca. 1861. Image from Wikipedia. Worker pushing a cart of bones in the Paris Catacombs, ca. 1861. Image from Wikipedia. Photograph by Felix Nadar in the Paris Catacombs, ca. 1861. Image from Wikipedia. wonder what kind of pay these men got? is this just a labors job or one of honor? who would be willing to work on this kind of project? This is an amazing set of pictures! I’ve been in the Paris catacombs, it’s a fabulous, though kinda gruesome, way to spend a few hours. Highly recommended.